SAFETY FIRST: Protect your joy con battery from over-current and over-voltage protection. It can cut off the power for safety automatically by the intelligent circuit when necessary. 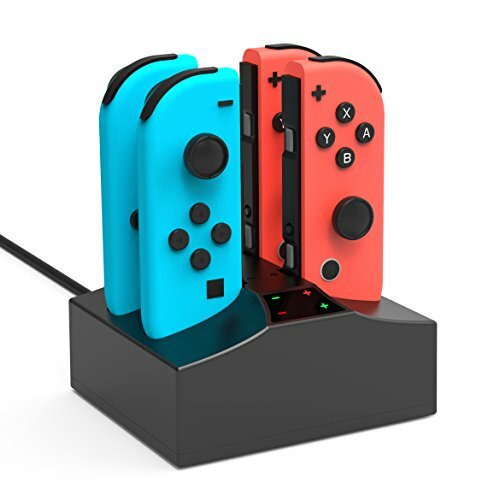 4 IN 1 CHARGER: Charges up to 4 Joy-Con Controllers simultaneously. Just slide each Joy-Con into the dock to connect the charger, and you can know the status through the LED indicator. NOTE: Wall AC adapter is NOT included. The Charging Dock comes with Type C port. Powered by 60inch USB Type C Charging Cable. You can connect to the 5v~1A power adapter for your phone or just connect to your desktop device. 12 MONTHS WARRANTY: We make YCCTEAM AC adapter so that it can be used thousands of times with you. We provide limited 1-year warranty. If you have any question, please feel free to contact us, we are always willing to provide you with the best service. For sure a 5-star purchase!